It has never been more important to stand out from the crowd than in today’s competitive beverage market. Labels are key components of any brand marketing mix, allowing manufacturers to differentiate their products and give end consumers the information they need and increasingly expect. Precise application of high-quality labels typically contributes to an excellent brand experience. At the same time, a growing variety of beverage types and bottle formats has made labelling increasingly challenging. More than ever, flexibility has become a valuable benefit to beverage producers. For them, top priorities today are faster product and format changeovers, simple operations and optimised processes that use the same equipment for different label types, still ensuring consistent uptime. In order to meet these demands, Sidel has introduced the new EvoDECO labelling solutions. Based on a common core and optimised design, they enable producers to deliver different stock keeping units (SKUs). 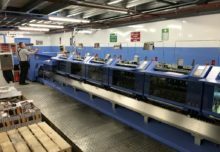 They might either include several labelling applications in one multi-technology machine or a single labelling application through dedicated equipment, for optimised uptime, reduced footprint and low total cost of ownership (TCO). The EvoDECO platform is built using the latest technologies regardless of model or configuration. This gives beverage producers the ability to choose solutions based on their specific labelling needs and output levels, without compromising on flexibility, efficiency or sustainability. Sidel’s most flexible labelling solution to date, the EvoDECO Multi, brings modularity into labelling. It offers a standardised carousel that can be equipped with up to four different labelling technologies: roll-fed, self-adhesive, cold glue and hot melt. This allows manufacturers to set up the machine for their unique labelling needs, as they can easily apply several types of labels to different types of containers and packaging materials (PET, HDPE, glass), of varying formats and dimensions (from 0.1L to 5L), on a single machine at speeds from 6,000 up to 81,000 containers per hour. Switching between various labelling modules is quick and easy, thanks to Plug & Play connections, offering producers the freedom of labelling choice and total flexibility. 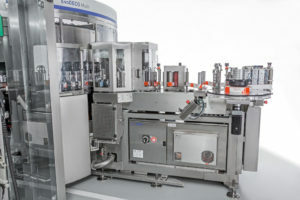 As part of the Sidel Matrix platform, the EvoDECO Multi has been designed for modularity, flexibility and performance. It allows for up to 36 layout configurations and a 30 per cent faster changeover time. It also offers 98 per cent efficiency with non-stop labelling as well as lower TCO through reduced electrical consumption, maintenance time and optimised glue management. Attention has also been paid to ergonomics and operator safety: Easy operations, cleaning and maintenance are facilitated by its open, frameless structure. This, together with the re-design of all the single modules, results in a significantly enhanced machine uptime. New brushless motors integrated into the carousel and the labelling stations remove the need for lubrication and achieve great energy savings. The new EvoDECO Multi labeller was developed to handle all labels, even ultra-thin, with utmost precision, ensuring top label quality application and performance at a very high level. The EvoDECO labelling technologies can also be installed as dedicated applications, answering manufacturers’ needs for maximum performance. Boasting four carousel sizes, up to three labelling stations and 24 configurations, the Roll-Fed can generate outputs of up to 72,000 containers per hour at an efficiency rate of 98 per cent. It is particularly suitable for water, carbonated soft drinks (CSD), juices and dairy producers. Using hot glue to apply wrap-around plastic labels, it can handle lightweight containers and ultra-thin labels, yet allowing for better glue control and distribution, together with reduced consumption. The ergonomics of the solution have been significantly optimised for performance and efficiency as reflected by the linear design of the roll-fed station, with all main components fully visible and accessible during production or maintenance, without disengaging the station. Cleaning can be carried out completely automatically during production by a system installed on the vacuum drum, which removes any glue residual for higher performance. 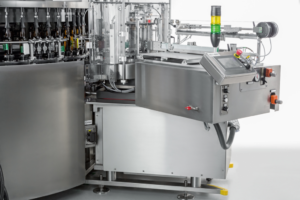 It can also be equipped with an automatic label extraction system (protected by Sidel patent), ensuring no downtime occurs due to labels being not properly applied on the bottle or no bottles being present, for a smooth and consistent flow of production. The label application is carried out with a pad-to-pad transfer, leading to a very stable and accurate process, even at high speeds. Furthermore, the reels auto-splicing system can be activated at very high speeds of up to 30,000 containers per hour resulting in improved productivity. 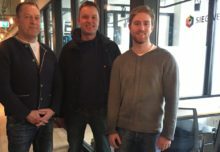 While developing the EvoDECO Roll-Fed labeller, ease of operations has been high on the Sidel engineers’ agenda, as this is instrumental in securing maximum flexibility and performance. The solution can be controlled and adjusted via a human-machine interface (HMI) which is integrated within the labelling station. Additionally, the vacuum drum is built in light-weight sectors for easy and quick replacement, without disengaging the station, and also features newly patented adjustable pads for longer production time and less time needed for maintenance. With an integrated glue tank, patented vertical melter and heating control, glue is melted on demand and circulated always at a precise temperature and in smaller quantities, increasing the label quality application. This allows for reduced consumption of glue and avoids glue degradation, glue filament, and glue splashing, for better overall quality and improved sustainability. The Adhesive labeller is designed to apply labels at high speed with increased efficiency. It can be equipped with six different carousel sizes, up to five labelling stations and 36 configuration possibilities. Able to apply plastic or paper Pressure Sensitive Labels (PSL), it has been optimised to suit the needs of beer, water, food, home and personal care producers. 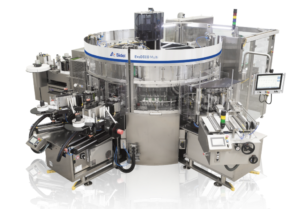 The advanced unwinding, feeding and peeling control, through highly efficient servomotors, enables greater stability and precision in the labelling process. This allows the machine to handle also ultra-thin labels, down to 25μ, with top quality application at speeds of up to 66,000 containers per hour. It also delivers the flexibility that manufacturers need in applying labels to a variety of containers of different shapes and sizes. The EvoDECO Adhesive labeller is equipped with brushless motorisation of the bottle platforms to smoothly handle round and shaped bottles. 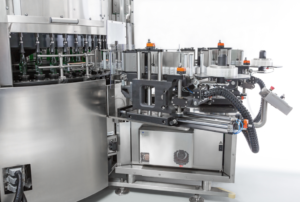 A vision system can be added for accurate bottle orientation and label positioning. An air-dancer and a push-pull system ensure that the labels are not under any stress at any point, to avoid labels web liner breakage, and to ensure the correct alignment with the containers being labelled for a flawless “no-label” look. Users can configure the labelling module with either two reels – both engaged, applying two different labels – or a master-slave non-stop labelling, applying the same label without production downtime during reel changeover. The machine can apply up to ten different labels to the same bottle while a highly efficient auto-splicer changes reels without any reduction in production speed. The automatic opening and closing of the protection window, a Sidel patented solution, makes it possible to engage or disengage modules for changeover or maintenance, for complete operators’ safety. The Cold Glue labeller is available in six carousel sizes and can feature up to five labelling stations, making it easy to configure according to bottle size, output need and product type. Capable to generate outputs of up to 81,000 containers per hour, the solution handles partial pre-cut paper labels, as such it is particularly suitable for the beer, food, home and personal care markets. It comes with a fully washable stainless-steel structure and components: this, together with an automatic cleaning system, dedicated to all the parts that come into direct contact with the glue, ensures top levels of hygiene. The easy-to-operate labelling station features quick-release tool-less label pallets for quick changeover time, while consistent uptime is ensured by the automatic label magazine loading system. The Sidel EvoDECO labelling solutions offer beverage producers both total flexibility and unmatched performance to deploy any kind of labelling technologies for all containers. The modular design is coupled with the latest technological innovations in order to deliver high efficiency, low total cost of ownership with high output and, above all, great brand experience. 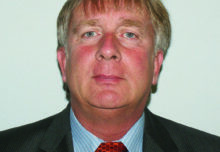 More information on Sidel EvoDECO solutions: Sidel.com/labelling. When integrated in the Sidel Super Combi, the EvoDECO Roll-Fed labeller can generate outputs of up to 81,000bph.